The fifth and closing round of the Italian ACI Karting Championship has ended with several exciting Finals at the Circuit of Siena. A total of 221 drivers made it to the track in the 9 categories partaking in the title decider, which made the total number of drivers climb up to 1,170 including the first four rounds held in Lonato, Sarno, Battipaglia and Adria. A total of 18 Finals took place at the fifth and closing round of the Italian Championship to award the titles in all categories. The new champions are Zanchetta (KZ2), Minì (Mini), Di Simplicio (KZ4), Di Lorenzo (KZ3 Under), Pagano (AK), Bardas (AKJ), Bombardelli (KZ3 Junior), Tempesti (KZ3 Over) and Brizhan (OKJ). KZ2 – MARCO ZANCHETTA IS THE NEW CHAMPION. The most powerful category KZ2 has seen Marco Zanchetta on Maranello-Tm taking the title after leading the Championship since the first round in Lonato. The third place in Race-1 has been enough for Zanchetta to clinch the category Title in a final that saw the victory going to Giacomo Pollini (Formula K-Tm), who led Danilo Albanese (Tony Kart-Vortex), while the other great protagonist of the Championship Francesco Celenta (Praga-Tm) had a problem at the final corner due to a slight contact on Albanese due to a lapped driver while in the leading group. The other protagonist of the championship Giuseppe Palomba ended his effort in eighth place on Intrepid-Tm, proceeding also Flavio Sani (Maranello-Tm), Daniele Vezzelli (CRG-Modena), Marco Pastacaldi (Maranello-Tm) and Kristijan Habulin (TB Kart-Tm). Flavio Sani had the upper hand winning Race-2, from Celenta who recovered from P10, while Albanese was again on the podium in P3. Pastacaldi was fourth, Zanchetta fifth, Pollini sixth. 60 MINI – GABRIELE MINI’ IS CHAMPION. In 60 Mini the American Ugo Ugochukwu (Energy-Tm) has been the ruler of the smallest category, but the title went to Gabriele Minì (Parolin-Tm), who has been good to manage the classification lead he had previously built and the third place in the first final allowed him to close the Championship one race early. He, therefore, repeated the victory of the title scored last year. In Race-1 Ugochukwu took the victory proceeding the Dane Conrad Laursen (Tony Kart-Tm), while Gabriele Minì was third and took the title of Champion. In Race-2, Ugochukwu claimed another win, this time crossing the finish line ahead of Minì and the two Formula K Junior drivers Raffaele Gulizia and Michael Paparo, also among the main title contender up to this closing round. KZ4 -THE CHAMPIONSHIP TOLINO DI SIMPLICIO. In KZ4, Lino Di Simplicio (EKS-Tm) took the category title thanks to the second place behind Paolo Gagliardini (Sodikart-Tm) and ahead of Cosimo Damiano Antoniello (Oberon-Tm) in Race-1, before coming fourth in Race-2, final won by Claudio Cusumano (CRG-Tm), Antoniello and Maurizio Giberti (Maranello-Tm). Di Simplicio secured the title as he totaled only one point more than Antoniello. KZ3 UNDER – LUIGI DI LORENZO CHAMPION. The KZ3 Under title has been awarded at the “photo-finish” and Luigi Di Lorenzo (CRG-Tm) managed to pip Emanuele Simonetti (Tony Kart-Tm), as both drivers totaled 100 points, but Di Lorenzo had the best discriminant of the highest number of best results: Di Lorenzo obtained two wins, while Simonetti only one. In Race-1, Riccardo Nalon (Formula K-Tm) took the win leading Simonetti and Di Lorenzo, while Di Lorenzo took his second win of the season in the closing meters of Race-2, proceeding an excellent Francesca Cifola (Maranello-Tm) who led throughout the second final. The third step of the podium of Race-2 went to Alessio Zanotti (Maranello-Tm), while Simonetti was fourth. 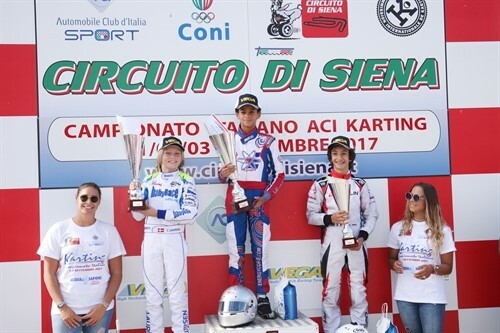 ACI KART – FRANCESCO PAGANO IS THE NEW CHAMPION. In ACI Kart, Francesco Pagano (Lenzokart-Iame) came out victorious after the fourth place obtained in Race-1, and a very important second place in Race-2 that allowed him to clinch the title. 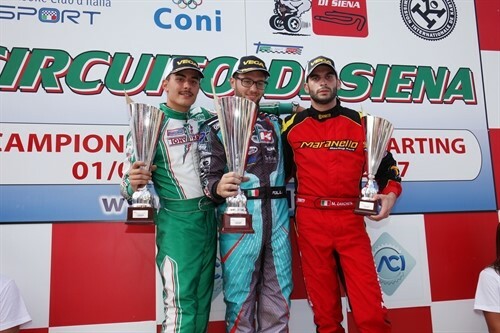 Cristian Comanducci (Tony kart-Iame) won both finals, having the upper hand on Mario Martucci (Tony Kart-Iame) and Marco Settimo (Birel-Iame), in Race-1, while Pagano and Settimo completed the podium of Race-2. Pagano won the title with 219 points, while Settimo and Comanducci were respectively second and third at 214 and 210. ACI KART JUNIOR -ALEKSANDER BARDAS. CHAMPION The Italo-Polish driver Aleksander Bardas (DR-Iame) took the third place of Race-1 which earned him the category title for the second year in a row. The first of the two finals was won by Federico Albanese (Tony Kart-Iame) who led Alessandro Balzarotti (Zanardi-Iame), and Bardas. In Race-2, Leonardo Fornaroli (Zanardi-Iame) took the win leading Tommaso Chiappini (Tony Kart-Iame) and Balzarotti in a red hot final. Bardas was fifth, following Albanese, but he had the mathematical certainty of the title. KZ3 JUNIOR – TITLE TO LUCA BOMBARDELLI. In KZ3 Junior, the second Final awarded the category title. In the end, Luca Bombardelli on Maranello-Tm, took the title after coming fourth in Race-1, behind Alessio Mordini (Energy-Tm), Roberto Cesari (Oberon-Tm) and Mattia Giannini (Maranello-Tm), while the third place in Race-2 gave Bombardelli the necessary points to claim the title win. The victory of the second final went to Giannini, Mordini was second. Bombardelli won the title as he scored only 8 points more than the runner up Giannini. KZ3 OVER – CLAUDIO TEMPESTI CHAMPION. KZ3 Over had a surprising end, as Roberto Profico (Sodi-Tm) was pipped to the post by Claudio Tempesti (CRG-Tm) after he led the classification for the whole season, but the latter has dominated this closing round. Tempesti secured a decisive win in the first final, leading Andrea Tonoli (Maranello-Tm) who put in a good comeback race, while Profico had to settle for P3 after a lively position exchange on top of the charts. The victory of Race-2 went to Profico, while Tonoli was second again and Simone Torsellini (Zanardi-Tm) third, while Tempesti was fourth but certain of his title victory having scored 2 points more than Profico. OK-JUNIOR – ALEXEY BRIZHAN CHAMPION. 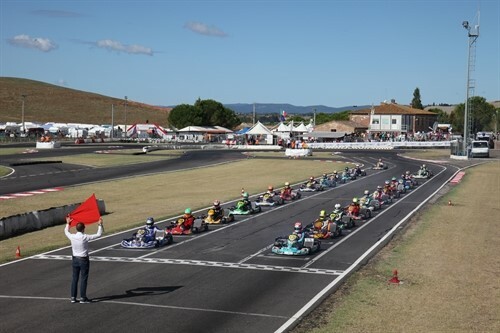 The Russian Alexey Brizhan (Tony Kart-Vortex) won the OK-Junior title at the end of the second Final, thanks to the second place obtained behind Francesco Raffaele Pizzi (Luxor-Vortex) and ahead of Luigi Coluccio (Birel-Tm). In Race-1, the victory went to Luca Bosco (Tony Kart-Vortex) after a series of exciting moves. He led Leonardo Caglioni (Birel-Tm), while Brizhan was third. Berizhan won the Championship as he was 11 points clear of Bosco. MONEY PRIZE: The money prize devised by ACI Sport for 2017 amounts to Euros 50,000 with the following partition: KZ2, OK, OK-Junior, ACI Kart, ACI Kart Junior, 60 Mini: Euros 3.000,00 for the winner of each category, Euros 2.000,00 for the second and Euros 1.000,00 for the third; KZ3 Junior, KZ3 Under, KZ3 Over, KZ4: Euros 2.000,00 for the winner of each category, Euros 1.000,00 to the second and Euros 500,00 to the third.